Brokerage CEO: Small investors are back, baby! 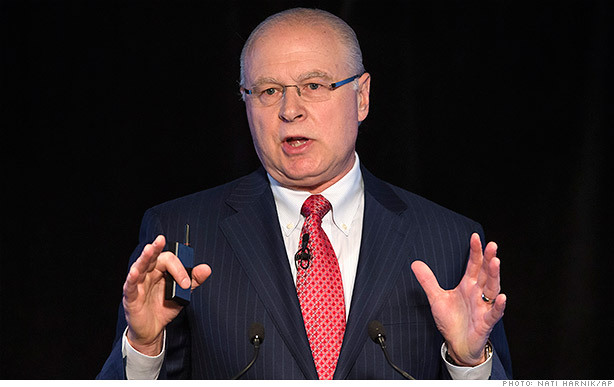 TD Ameritrade CEO Fred Tomczyk says individual investors are getting back into the markets at a record pace. Individual investors are jumping back into the market at a record pace, according to Fred Tomczyk, CEO of online brokerage firm TD Ameritrade. "People are generally more bullish on the U.S. economy," Tomczyk told CNNMoney at the Milken Institute Global Conference in Los Angeles Tuesday. Tomczyk said that trading volume on TD Ameritrade (AMTD) hit all-time highs in the first quarter of 2014, a trend that's been echoed in earnings reports by TD and other online brokerages such as Schwab (SCHW) and E* Trade (ETFC). The surge in trading by so-called small or "mom and pop" investors comes over a period when the markets experienced a lot of volatility. "It started five months ago, but it's been building," he said. "When the market has a little bit of chop, that's a good market for us." Tomczyk also noted that "buying on margin," or borrowing money to purchase stock, also reached a record for TD Ameritrade in the first three months of the year. Buying on margin is a game of high risk and high reward, as gains as well as losses are amplified. Despite strong first quarter earnings for TD Ameritrade, the stock took a beating after the release of Michael Lewis' book "Flash Boys" and subsequent TV interviews where the author claimed the market is rigged in favor of high frequency traders. In the book, Lewis takes aim at what's known as "payment for order flow," a practice in which brokerages receive compensation for routing clients' orders to third parties, including high frequency trading firms, to execute. But Tomczyk shrugged off concerns about the system. "Payment for order flow has been around a long time, the SEC has looked at it," he said. Tomczyk said his company doesn't disclose the revenue it brings in from the practice, but many analysts think it's a lucrative chunk of business for brokerages. The bottom line is brokerages are benefiting from the return of the individual investor, a significant turn of events after the recession when many Americans lost confidence in the markets. "People want to get back to normal," Tomczyk said. "It's been a long, tough crisis."